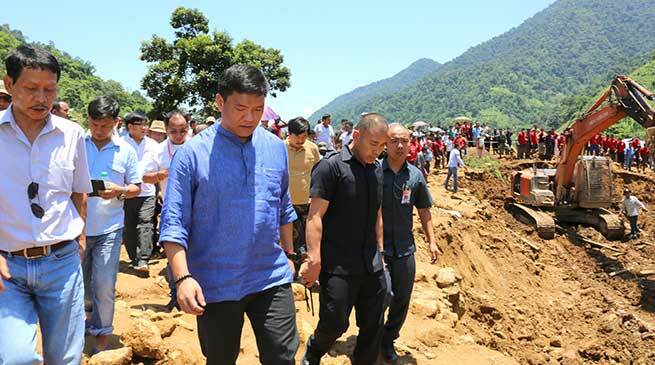 Chief Minister Pema Khandu today visited the landslide-hit area in Laptap village near Sagalee taking 3-hour drive from here despite the poor connectivity and rough roads , he visited the spot hit by landslide, where 14 people had lost their lives. The Chief Minister was accompanied by State BJP President Tapir Gao, former CM Nabam Tuki, Home Minister Kumar Waii, UD Minister Nabam Rebia, Disaster Management Parliamentary Secretary Kaling Moyong and UD Parliamentary Secretary Techi Kaso. The Chief Minister inspected the site of the incident and interacted with officials from district administration, NDRF and state police to oversee the rescue operations being carried out. The Chief Minister then visited the tented camp where bodies recovered from the site were kept for cremation. He met the relatives of victim family and assured all possible help from the state government’s side. The Chief Minister expressed his sympathies to the bereaved families and offered his “deep condolences’ for the victims of the massive afternoon landslide that took place yesterday. Later in a gathering, the Chief Minister handed over Rs 10 lakhs on behalf of state government to the next of kin of the victim family as immediate relief. He also donated Rs 30 lakhs from his personal means as immediate assistance to the victim family. Speaking to the villagers, he said that on being informed about the incident yesterday, he had immediately instructed the state administration, home and health department to carry out rescue and relief operations with adequate food supplies, medicine and doctors. Expressing his deep sorrow over the incident, the Chief Minister said it is a moment of great sadness that 14 members from a single family have lost their lives in the tragic incident. “Human loss is a big loss, which can never be compensated though material loss could be recovered,” he said and appealed the people to pray for the departed soul. On Sagalee area being cut off from rest of the world, the Chief Minister informed that district administration has been instructed to resume the relief and rescue operations for stranded people. He informed that helicopter has been pressed into service for the purpose with all relief measures being taken especially for the patients with ambulance facilities in the Naharlagun helipad. He also informed that state government is making all effort for restoring the road communication to Sagalee, which is cut off from all sides.